The Northern Province (Tamil: வட மாகாணம் Vaṭakku Mākāṇam; Sinhala: උතුරු පළාත Uturu Paḷāta) is one of the nine provinces of Sri Lanka. 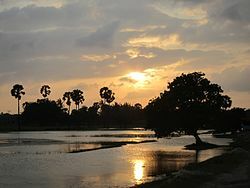 The capital of the province is Jaffna. The Sri Lankan Civil War began in this province. It where most of the Tamil people in Sri Lanka live. Provinces in Sri Lanka were created in the 19th century. Provincial councils were created in 1987 by a change to the Constitution. Between 1988 and 2006 the Northern Province and the Eastern Province were temporarily put together to make the North Eastern Province. ↑ "A trip to Sri Lanka's Tamil country". BBC News. 22 August 2009. This page was last changed on 13 April 2018, at 05:37.